"Psychotherapist. Peace and war. Power and love"
Polish Federation for Psychotherapy, Polish Association for Integrative Psychotherapy and Independent Crisis Psychotherapists of Ukraine invite for the International Conference “Psychotherapist. Peace and war. Power and love”. In extremal conditions, psychotherapy has to be effective. It is connected with responsibility, since one cannot undo what has happened. That is why we want our conference to create space for all, that is extreme in the psychotherapy profession which confronts us with the war in its various aspects. We shall look, with our eyes wide open, at all wars, from which real peace and inner strength may arise. Sometimes these are the inner wars of our patients. But the essential meaning of war is when one country invades another. Peace requires space for war. The psychotherapist, facing life and death at their fullest gains power, wisdom and the ability to respond to his clients' needs; gains the courage to lead people towards peace and happiness. Our conference shall serve psychotherapeutic practice. We shall meet as clinicians and as scientists to share our experience and knowledge how to provide better aid for our clients. 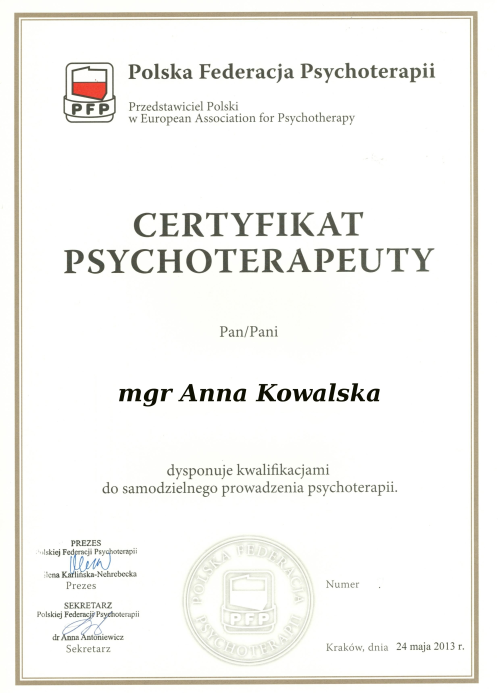 Polish Federation for Psychotherapy (PFP) is the largest professional organization of psychotherapists in Poland. Organizational member of the EAP, has the status of Polish NUO/NAO. The aim of the Federation is to promote psychotherapy for the common good and representing Polish psychotherapists in front of authorities and organizations in Poland and abroad. Having signed the Strasbourg Declaration, the PFP recognizes psychotherapy profession as autonomic. The PFP constitutes a platform for discussion and action open for psychotherapists of various modalities. Polska Federacja Psychoterapii odpowiadając na zapotrzebowanie profesjonalnych psychoterapeutów pragnących uzyskać potwierdzenie swoich kwalifikacji przez odpowiednią organizację psychoterapeutyczną, zaprasza do składania egzaminów na Certyfikat Psychoterapeuty Polskiej Federacji Psychoterapii. Procedura egzaminu jest zgodna z wymogami NFZ. Wkrótce ogłoszone zostaną terminy składania aplikacji do nadchodzącej sesji egzaminacyjnej wiosna 2015 oraz termin egzaminu testowego. Polska Federacja Psychoterapii (PFP) powstała w grudniu 2004r. Jest największą organizacją zawodową psychoterapeutów, zrzesza ok. 1200 przedstawicieli tego zawodu. Działając w oparciu o Strasburską Deklarację Psychoterapii PFP uznaje zawód psychoterapeuty jako autonomiczny oraz stanowi platformę dyskusji i działania otwartą dla psychoterapeutów wszystkich nurtów i kierunków psychoterapii uznanych przez WHO. Oznacza to, że posiada status organizacji parasolowej – National Umbrella Organization, oraz status organizacji przyznającej – National Awarding Organization. Zgodnie z wymogami EAP status ten jest odnawiany co 5 lat.